It was either a tiny picture taken by the yearbook photo factory, or a one-handed self portrait with my phone. 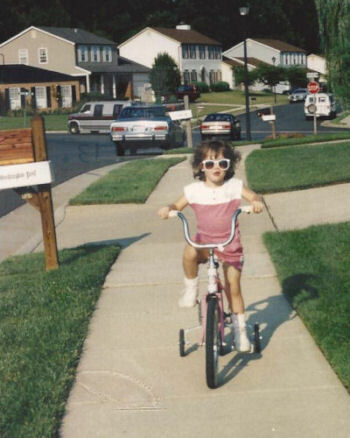 Until I save enough for a quality photo shoot let’s all just enjoy this nostalgic snapshot of me at age three, doing my best impression of Easy Rider Barbie. My blog is only mostly literary – reviews and musings on literature, authors, publishing, doubling as an example of my writing style and skills, as well as a collection of my thoughts. One of the best parts about being a writer is the excuse of getting to research whatever I want, because I love to read about interesting things and then sometimes put that knowledge back into my work. Arborsculpture? Mosquito Bay? The culinary history of the turducken? They could all make a surprise appearance on my blog, and then show up later in a story. I was born and raised in Northern Virginia and still currently live here, with Washington D.C. as my backyard city. I work at a pretty great data management company, my co-workers and supervisors keep it from being a dry 9-to-5. My dream job, besides becoming the next Neil Gaiman, is to somehow combine my writing and traveling. Have pen, will travel.